Late last September, in this very space, I put up a short post entitled “Clayton Kershaw Experimented On the Rockies.” The idea: Two times, in low-leverage situations, Kershaw showed Rockies hitters a new twist. Specifically, the over-the-top southpaw dropped his arm angle to deliver what was more of a tailing fastball. It’s weird whenever a high-profile pitcher does anything different, and it was fair to wonder whether Kershaw might bring the tweak into the playoffs. He did! Take a look. Borrowing from Texas Leaguers, here are Kershaw’s release points last year, before and then beginning from the Rockies start. It’s easy to spot the exceptional pitches. When Kershaw dropped down — which he apparently did a total of 25 times — his release point dropped a half-foot, and it shifted over roughly a foot and a half. That’s a significantly different throwing motion, and you could see from Kershaw’s follow-throughs that nothing about it was ordinary. The lower slot was supposedly how Kershaw used to throw in high school. He was inspired to bring it into game action by teammate Rich Hill. Clayton Kershaw is the best pitcher in the world. Therefore, one should always be inclined to give him the benefit of the doubt. You’d think that whatever Kershaw touches should turn to gold. But how did this experiment actually do? 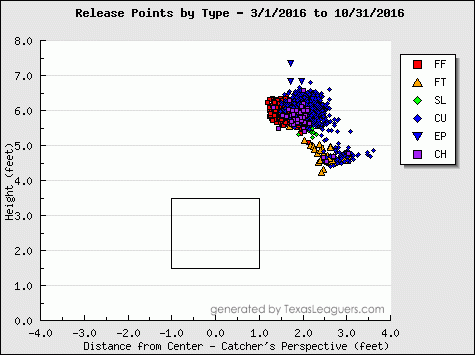 I’ll note that, of Kershaw’s 25 lower-slot pitches, all of them were fastballs. They averaged two inches more drop than Kershaw’s normal four-seamer, and six inches more horizontal break. Over the games in which Kershaw dropped down, his regular fastball averaged 93.9 miles per hour, and his drop-down fastballs averaged 95.3. Hey, that’s pretty good! And, I showed you the Anthony Rizzo home run. The start before, Kershaw tried the same thing on Rizzo, and Rizzo *almost* went deep. Or, I guess he did go deep, but just not the right kind of deep. We’re talking about 25 pitches. One can reach no firm conclusions. Encouragingly, Kershaw’s drop-down fastballs were fast. Discouragingly, they didn’t seem to screw with hitters that much. Encouragingly, Kershaw had the confidence to drop down in playoff situations in the first place. Discouragingly, his motion was weird and his command of the fastball was lacking. Kershaw’s average drop-down fastball was higher than his average normal fastball, even though the movement would dictate putting in lower zones. More than a few times, the pitch was left up. I don’t know if we’ll see Kershaw do this anymore. Maybe the experiment is over. Maybe, like the changeup, Kershaw will work at this without ever perfecting it. Maybe, like the slider, Kershaw will perfect it, and the best pitcher in the world will get even better. Plenty still to find out! I would suggest that, if this is something Kershaw does intend to keep up, he learn a second lesson from Hill. Hill, you see, throws both fastballs and breaking balls from his lower slot. Kershaw didn’t do that, and so one could interpret his drop-down as something of a tell. It’s worth keeping in mind. Kershaw’s experiment, in its first run, was nothing fantastic. Maybe there’ll still be more trials. We hoped you liked reading The Results of Clayton Kershaw’s Experiment by Jeff Sullivan! Does J.J. Hardy Even Like Hitting? It seems like he just needs to keep working on it. I would love to see a lower arm slot Kershaw Slider/Curveball. If he can get more comfortable/command it = Nastiness.